Welcome to Slate Falls Airways. Just after getting home from a tour in Africa, I returned a call from Vern Hollett, the owner of Slate Falls Airways based in Sioux Lookout, Ontario. Slate Falls was running two Otters, a Beaver, and a couple of Cessna for their mostly summer operation servicing the northern native communities and flying the fishermen into their own fly-out fishing camps. 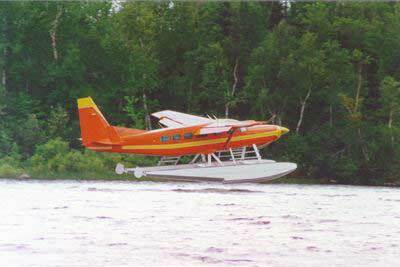 When an opportunity to get a good buy on a Caravan floatplane came up, Vern couldn't resist. He decided to go for it and bring in the relatively expensive Caravan to replace one of his aging single Otters. Vern had called me, hoping that I could help him check-out his pilots on their new Caravan. I agreed, and drove out to Sioux Lookout. Within a few hours we were airborne to try out the beautiful orange Caravan, C-GSFA. With the 675 hp and the cool air the Caravan fairly leapt off the water compared to the 600hp Caravans we fly in Nigeria. We climbed up to 5000 feet and leveled out to an indicated cruise speed of 152 knots. 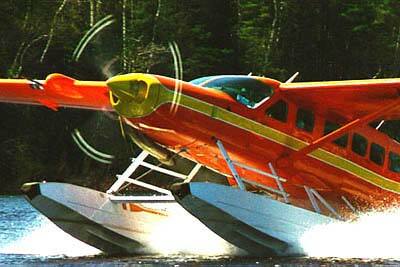 Definitely the fastest floatplane around. At 9000 feet and with a tail wind, we reached a ground speed of 198 knots breaking all floatplane speed records for the trip between Slate Falls and Sioux Lookout. In my hurry to get to Sioux Lookout I had forgot to buy film, but luckily one of the Slate Falls pilots, Rich Hulina, is an aviation photographer and was able to provide me with some great images of their bright orange Caravan. The pilots I had the time to fly with were serious in learning, keen in their interest, and certainly well qualified in what they were undertaking. These pilots renewed my belief that Canadian bush pilots are the best in the world. Of course, then, I am biased. I would like to thank them for their hospitality. I would especially like to thank John, the Beaver pilot, for the great ride he gave my seven year son, Logan, from the front seat. I would also like to thank Vern for the fishing trip. Logan caught a walleye on the second cast of his young sport fishing career. After a quick look and release, we enjoyed seeing the walleye swim away to be caught again another day. Rich Hulina, pilot/photographer, liked the Caravan so much he bought the company. For more great fly-out fishing resorts and lodges, make your web destination "Virtual North." Let the Attitude Indicator Take You Back to Friends.